I am trying to understand which cassettes I can install on my bike. I've understood that the length of the derailleur also determines which cassettes will fit. In my case I have a triple (see picture below), with a 10-speed cassette, in the range 12-25. My experience with this cassette (and 30-tooth chainring) in the 18% stretches is not too pleasant. 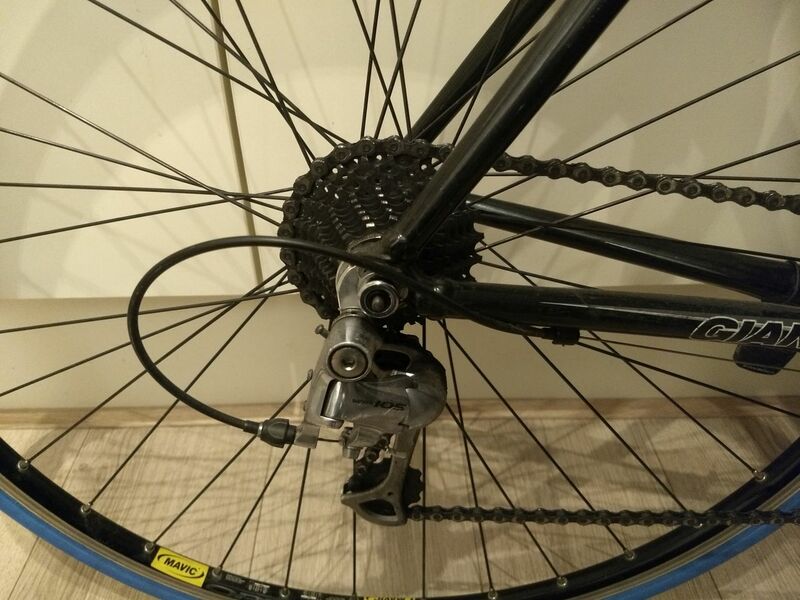 Therefore I am looking for options to replace it with a cassette with sprockets up to 27 or even 30 tooth. My main question is how I can determine which cassettes will fit on my bike. Even more I would appreciate a general answer, that explains what the limitations are of the derailleur when choosing cassettes, such that I can determine it myself. You can't work out from first principles in advance what kind of cassette your derailleur will work with--you need to know the model, and then look that up to find out what Shimano's recommendations are. Daniel R Hicks describes how you can determine whether a cassette that you've already installed will work. So if your bike has a 50/34 in front and a 12/25 in back, your derailleur needs to be able to wrap at least 29 teeth; if you switch to a cassette with a 30t low gear, you'd need 34 teeth of wrap. I'm not sure about the exact derailleur you've got, but apparently Shimano has made some version of a 10-speed 105 derailleur (possibly newer and different from the 105 you have) where the short-cage model can handle 34t and the long-cage 40t. So you're probably OK. So the max recommended cassette is a 27 tooth for that derailleur, whichever cage length you have. Shimano recommendations are often said to be conservative and you might only find a 28 nowadays that’s bigger than your 25. You could experiment with a 28 if that’s all you can find and discover if it will work on your particular bike. Make sure the chain is long enough if you increase tooth count. Not the answer you're looking for? Browse other questions tagged derailleur cassette or ask your own question. Good 9-speed cog configuration for touring and which low-cost quality cassettes? How do I achieve a lower gear on a Norco Bigfoot with a 9 speed cassette? I have changed the chain after my gauge showed that it's .75 worn. New chain jumps anyway. Why? How to deal with it?